I think my next article will be a summary of weight reducing actions that occurred to the Porsche Track Car but first I think discussion of the wiring is warranted. Many of the items jettisoned to reduce the weight of car were fed by the electrical system of the car. There is a truly massive harness that goes from the engine compartment to the passenger compartment. As I stripped out the car, I literally cut this harness out with a metal grinding disk. I vowed to go back with a minimalist custom wiring system. I decided to keep the fuel pump relay as stock as possible. I kind of like the idea of the fuel pump turning off in the case of an accident. Emergency battery cuttoff switch – same thing. I like to be able to shut down the electrical system in the event of an accident. It’s also required by NASA, PCA, SCCA, etc. Heater fan – I wanted to be able to blow some air on the windshield for defrost purposes, although without A/C, it’s not as effective. I ran dedicated ground wires for all circuits, as much as possible. So with this in mind, I started with a control panel that I bought from Summit. I dedicated its available toggle switches to Master on/off, Fuel Pump, Radiator Fan, Lights, Defrost Fan. Plus it has a push to start switch. The center of my custom dash held the switch panel. Behind it I mounted relays. I found out later that the load from all of the above through the fuse for the master on/off switch would blow a 40 amp fuse. Not wanting to go any bigger on the fuse, I had to install additional relays for the radiator fan and the headlights in the engine compartment and feed them directly from the alternator. As I said, I wanted to maintain the DME/fuel pump relay. Actually, with the exception of adding a toggle switch for the fuel pump, I wired the DME/fuel pump relay exactly stock. One area that gave me quite a bit of puzzlement was where to mount the emergency battery disconnect switch. The sanctioning bodies like this to be external to the car so the corner workers can get to it. I liked the idea of having it within my reach. 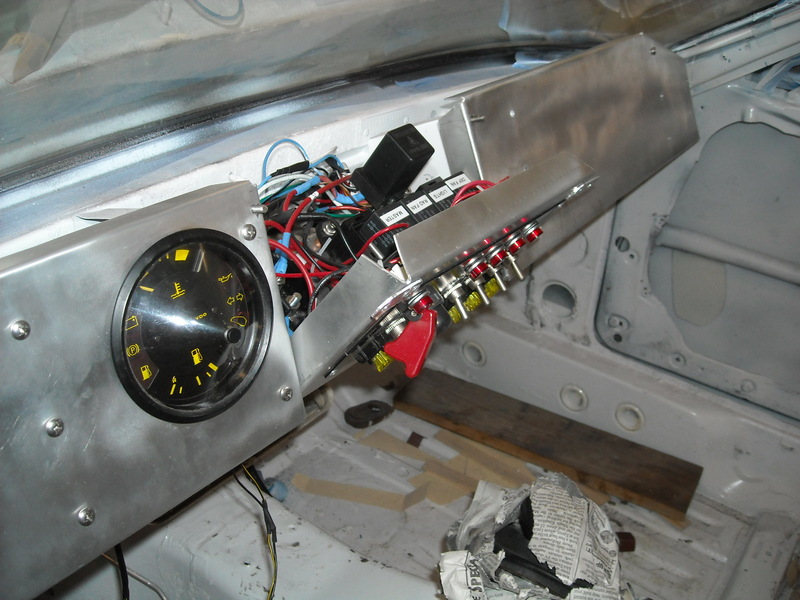 I decided to put it on the extreme left hand side of my custom dash, right next to the pull for my fire suppression system. I can reach it from there and a corner worker can reach in the open window to get to it also. I may ultimately have to mount a wire pull to the outside of the car to be legal. I buy all my wiring connectors, mainly 1/4″ flat spade connectors, from NAPA. Their quality seems to be a pretty good compromise between the really cheap junk and high end stuff. I solder all my connections and the encase them in shrink wrap. The shrink wrap is to keep the natural vibration of the cable from stressing the stranded wire just beyond the solder joint. It also provides a much neater looking installation. I bought an assortment of loop type wire ties (that attach with sheet metal screws) which I used copiously as well as standard wire ties. I used the stock tach, oil pressure, water temp, and fuel gauges. They are basically wired stock. I re-used the stock stalk for the wiper but I isolated the single circuit that caused the wipers to run at their fast speed and only wired that one circuit. I cut the stalk off short to avoid hitting it during the heat of the action. I must be old fashioned. I hate plastic corrugated wire loom. I prefer to wrap my harnesses in black cloth friction tape. I did break down and buy a “kevlar look” woven wire loom from Summit to run my harness from the dashboard back to the rear hatch area, for the fuel pump, fuel gauge, brake lights, etc. Wiring the car took multiple weekends of work. It is not a trivial effort. But it is very important to reduce the wiring to a minimum for weight saving and to do it correctly for reliability. Hi, I’ve found this entire rebuild really interesting. Some friends and I started up a local car club and recently acquired a 84′ NA. This will be our joint effort DE and AX track car. We recently installed the following; 89’951S rear suspension, aluminum trailing arms, adj koni struts, 951S control arms, larger anti-sway bars, larger calipers/rotors and totally gutted the interior. I really enjoyed your build because you did it all really budget minded. The guys and I can really use your story as a fine example to follow. Our problem is we’re kinda hung up on how to wire her up. Honestly we don’t know where to begin. If you could shed some more light on this that would be awesome. Thanks, from all the guys. Sorry, I can’t give you an easy answer on this. From a safety standpoint, I highly recommend a battery disconnect switch i.e. a big red handle. You might want to check NASA 944Spec website for some ideas on this. If you gut the existing wiring you will loose 25 pounds or so. I recommend that you NOT get rid of the fuel pump relay. Again, as a safety issue, you want that fuel pump to shut off when the engine quits running. As you can see from my article, I bought an auxiliary switch panel. You’ll need something like that if you use a custom dash. Beyond the mission critical circuits to let the ECU, the injectors, and the fuel pump work together, you can kinda do what you please. I could probably mark up a wiring diagram with the wiring I kept OEM, what I wired custom, and what I didn’t use. BTW, I don’t what to get too far up on my soapbox but I consider safety items (cage, seat, 5 or 6 point harness, fire suppression system, electrical cut-off, helmet, nomex suit/gloves/boots) much more important than go fast stuff, if you have to make a choice. Ultimately, Safe is Fast. One other thing. A habit left over from working on British cars. I run dedicated ground wires for everything. Thanks for the reply. 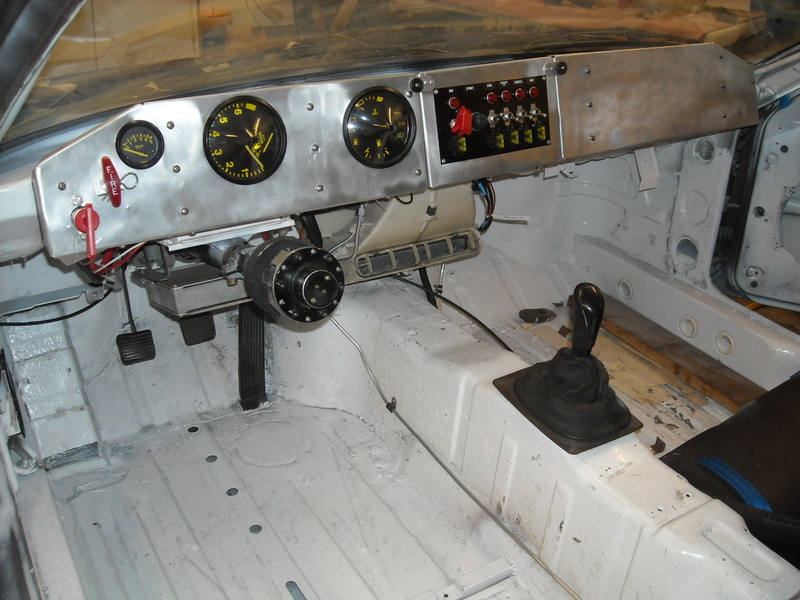 We’ve removed most of the interior wiring, all thats left are two main harnesses running from the engine bay to interior. The dme harness is self explanatory but the other that ran to to the fuse/relay board has us buffaloed. I know we’ll just have to dig into a schematic diagram but wiring is not our forte. Do you have any more pictures of how you wired or more of a right up, since we plan to duplicate your system? Thanks again from all the guys. I will be glad to help you in any way I can. That said, I would like for this to be a learning experience, not just me dictating how to do it. There are many ways to wire a track car. If you haven’t used/read Porsche wiring diagrams they’re pretty good but there are some “tricks”. I realize that I might color code a wiring diagram but you might be buffaloed with the part of actually reading the wiring diagram. Again, a phone call might be more efficient in this regard. I am going to mark up a wiring diagram for an 84 car with what I used stock, what I wired custom, with everything else being what I didn’t use, such as AC circuitry, etc. I will also take some photos but it can be pretty intimidating just to look at.